Did you catch the season premiere of Ask This Old House? 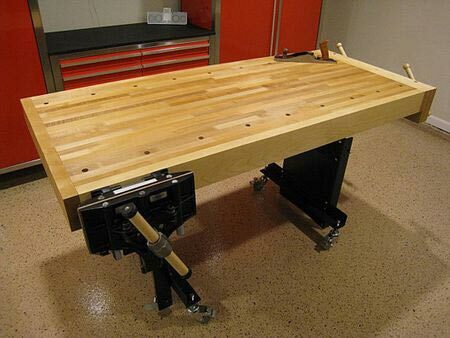 If you did, the cool adjustable workbench they were showing off might have caught your eye. The idea behind the Adjust-A-Bench is simple; to provide you with a workbench that is always at the right height for the task at hand. If you were doing assembly of a cabinet, you would want a lower working height, if you were routing, you would want a higher working height. The A-A-B offers a total adjustment range of 16.5-inches, with 12 locking height adjustments. It is solidly built using 1/8" thick mild steel with a powder coated finish. In testing the A-A-B was able to withstand 1684 lbs of weight, though they do not recommend exceeding more 850 lbs. You can pick up the A-A-B as a complete package at a starting price of $800, or you can purchase just the lifting mechanism and retro fit your existing workbench for $430.